More than 20 works of art by New College students are showcased in this year’s Juried Art Exhibition at the Isermann Gallery in the Caples Fine Arts Complex. On Jan. 31, members of the campus community and the public attended the opening reception and awards presentation. Now in its 10th year, the exhibit features various artistic mediums including sculpture, painting, photography, clothing and stained glass, and explores an even wider array of themes such as identity, memory, politics and religion. This year’s exhibit was juried by curators Ola Wlusek and Rhiannon Paget from The Ringilng Museum of Art. Three purchase awards went to Corrine Leavengood, Autumn Schwers and Lila Kreis. Their work will be accepted into New College’s art collection. Second and third place were awarded to Jamie Moriarty and Caitlin Matthews, respectively. Margaux Albiez, Jack Micoli and Gloria Pritchard received honorable mentions. Fourth-year Corinne Leavengood’s “The Aberration [sic] of the Virgin” is a thesis project formed using carpentry, stained glass, digital drawing and screen printing. The work explores Christian iconography in relation to concepts of masculinity and femininity. “This piece is about the struggle of being a female-bodied person and dealing with other people trying control your body whether it’s through the fight for reproductive rights or gender expression,” said Leavengood. 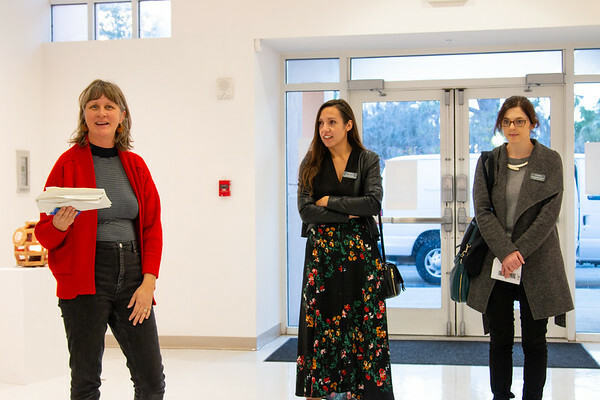 Professor of Art Kim Anderson, far left, prepares to announce the winners of the 2019 Juried Student Art Exhibition along with jurors and Ringling Museum curators Ola Wlusek and Rhiannon Paget. Students expressed the opportunity to exhibit as a learning experience, especially as emerging artists. 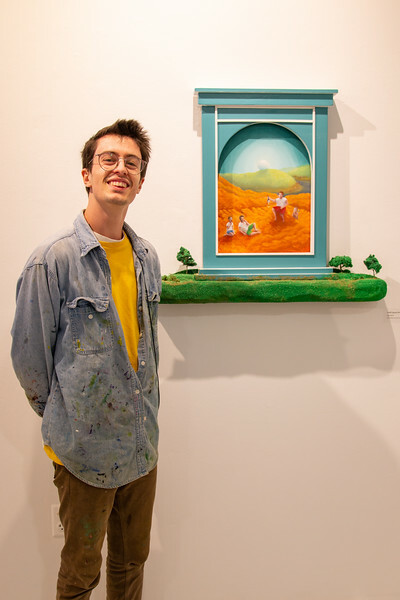 Fourth-year Jack Micoli, whose work received an honorable mention, added that the process of submitting to the exhibition is a nerve-wracking but validating experience when your work gets chosen. The exhibition will be on display in the Isermann Gallery until March 15.